What bottles do you offer? We offer 4 different types of refillable bottles. We have listed these below along with pictures and information of what they come with as standard. 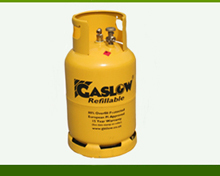 There are two variations of the Gaslow bottles. These are the 6KG and 11KG Bottles. They come supplied with the Gaslow remote filling kit and a Butane type threaded outlet. We can supply an adaptor to change the outlet to the Propane type threaded outlet. 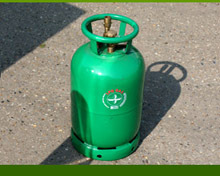 This Green Bottle (10.5KG) is produced by Prakto for us, built to the same standard as 4 hole LPG tanks as used on automotive vehicles this bottle is supplied as a direct fill with either the Propane or Butane threaded outlet. We can also supply this with a remote fillig kit if required. Our Black Bottle (14.4KG) is built to the same standards as the above Green bottle. However its elliptical shape offers more storage with only a little extra space. 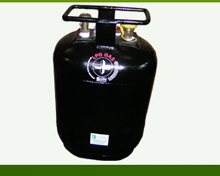 Again this bottle can be supplied with the Butane or Propane threaded outlet and has a direct fill valve. This can be supplied with a remote filling kit if required.